Embryonic stem (ES) cells are naturally derived from early stage embryos and induced pluripotent stem (iPS) cells are reprogrammed from somatic cells with overexpression of four reprogramming factors, Oct4, Sox2, Klf4 and c-Myc. Both ES cells and iPS cells are pluripotent stem cells with capabilities of indefinite self-renewal and can be differentiated into almost all cell types of the body, which make them valuable for studying early developmental biology, for modeling and as therapy for human diseases. Specifically, human iPS cells could be utilized to generate patient-specific lineages for a variety of translational research. In this review, we describe the cardiac differentiation from ES cells, iPS cells, and the current progress of using iPS cell-derived cardiomyocytes for heart disease modeling and for the development of therapeutic strategies. In addition, we summarize the recent direct reprogramming of cardiomyocytes from fibroblast cells, which provides another method for potential heart disease therapy. Development of the cardiomyocyte lineage from in vitro cultured embryonic stem (ES) cells has been extensively studied in the past decades . Mouse ES cells have been widely utilized as an in vitro model to study cardiogenesis, as cardiomyocytes were found to spontaneously differentiate from ES cells after withdrawal of LIF (leukemia inhibitory factor), which functions to maintain the pluripotency of undifferentiated mouse ES cells [2–4]. ES cells were aggregated into three-dimensional structures, termed embryoid bodies (EBs), and suspended in media containing fetal calf serum. Rhythmically contracting EBs with electrophysiological characteristics were present after 8 to 10 days of induction [5, 6], although the spontaneous differentiation efficiency was quite insufficient (Table 1). In order to improve the efficiency of cardiomyocyte differentiation from ES cells, chemical inducers such as dimethyl sulfoxide , all-trans retinoic acid , or 5-aza-2'-deoxycytidine , which were known to enhance cardiomyocyte differentiation in murine embryonic carcinoma (EC) P19 cells or mesenchymal stem cells, were introduced into mouse ES cell culture. In addition, several growth factors, including transforming growth factor-β2 , Wnt11 , Nodal , basic fibroblast growth factor (bFGF), and bone morphogenetic protein (BMP)-2 , as well as other reagents such as nitric oxide , SPARC , S100A4 , and ascorbic acid , were used to promote cardiomyocyte differentiation from mouse ES cells. The differentiated ES cell cultures are heterogeneous and contain undifferentiated ES cells, which could result in teratoma formation after transplantation into the host. 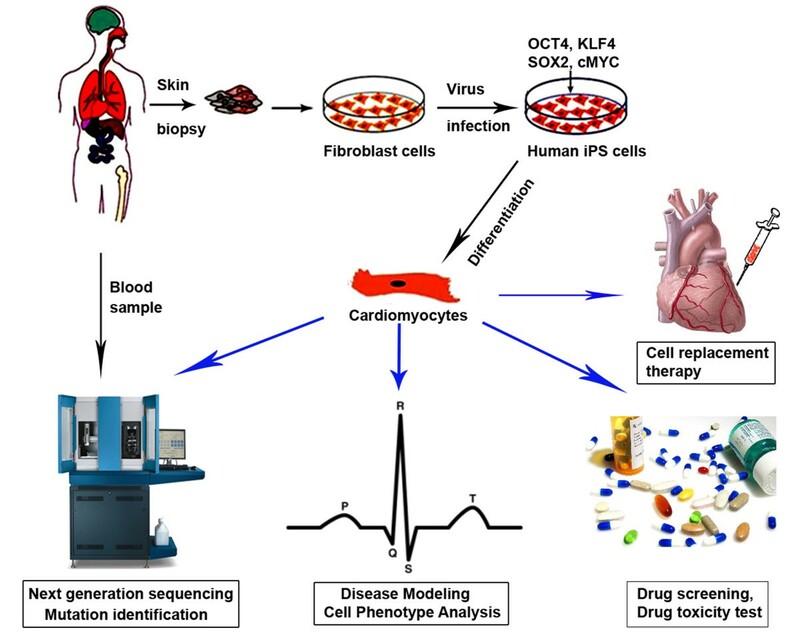 In order, therefore, to obtain a purified cardiomyocyte population from mouse ES cells, several approaches have been developed. Mouse ES cell-derived EBs were dissociated using collagenase, followed with a modified procedure by Isenberg and Klockner in 1982 to prepare the calcium-tolerant ventricular myocytes . Klug et al. in 1996  reported another transgenic selection approach for purifying ES cell-derived cardiomyocytes. The neomycin-resistant gene driven by the cardiac α-myosin heavy chain promoter was stably transfected into ES cells. After selection of neomycin-resistant cells, the resulting cells were shown to be cardiomyocytes with high purity (> 99%) . A similar approach was developed using a reporter green fluorescent protein (GFP) driven by the cardiac specific α-actin promoter. And the GFP-positive cardiomyocytes were isolated by fluorescence-activated cell sorting (FACS) . Mouse ES cell-derived cardiomyocytes formed stable engrafts in the mouse heart disease model and were extensively evaluated for their potential in tissue replacement therapy [1, 19, 21–24]. 5-aza-dC, 5-aza-2'-deoxycytidine; bFGF, basic fibroblast growth factor; BMP, bone morphogenetic protein; CM, cardiomyocytes; DKK1, Dickkopf homolog 1; DMSO, dimethyl sulfoxide; EB, embryoid body; EC, embryonal carcinoma; ESC, embryonic stem cell; FACS, fluorescence-activated cell sorting; FCS, fetal calf serum; Flk1, VEGF receptor 2; GFP, green fluorescent protein; HSVtk/GCV, herpes simplex virus thymidine kinase/ganciclovir; iPSC, induced pluripotent stem cell; ITS, insulin-transferrin-selenium; JI1, JAK inhibitor; LIF, leukemia inhibitory factor; LQTS, long QT syndrome; MHC, myosin heavy chain; MLC-2v, myosin light chain-2v; MSC, mesenchymal stem cell; PAC, puromycin-N-acetyltransferase; RA, retinoic acid; TF, transcription factor; VE, visceral-endoderm; VEGF, vascular endothelial growth factor. Seventeen years after the first establishment of mouse ES cell lines, the successful isolation and cultivation of ES cells of human origin was achieved [25, 26]. Human ES (hES) cells can be maintained in vitro for a prolonged period (approximately 250 population doublings), and have the capacity to differentiate into all three germ layer cells both in vitro and in vivo[25–27], which makes them an unlimited resource for providing various cell types for basic research, pharmacological testing, and potential therapeutic applications. Similar to mouse ES cells, spontaneously contracting cardiomyocytes of hES cells were detected when cultured in 15 to 20% fetal calf serum in the absence of the pluripotency-maintaining factor basic fibroblast growth factor [28–30]. Methods for cardiomyocyte induction from hES cells were mostly adapted from those used with mouse ES cells, such as addition of 5-aza-2'-deoxycytidine [28, 31], and the growth factors BMP-2  or BMP-4  to enhance cardiomyocyte differentiation efficiency. In addition, a co-culture system has been developed to differentiate hES cells on top of mouse endoderm-like cells - the END-2 cell line - which were found to secrete some undefined cardiac inducers that promote hES cell differentiation [34, 35]. However, most differentiation strategies remained suboptimal and could only induce approximately 5 to 25% cardiomyocytes from hES cells. Progress was made by Yang and colleagues in 2008 , when a staged protocol was established to induce cardiovascular differentiation from hES cells by following the biology of early heart development, which specifically yielded over 50% contracting cardiomyocytes after 20 days of differentiation (Figure 1a). In addition, Yang and colleagues isolated a multipotent cardiovascular progenitor population from hES cells and manipulated the specification of these progenitors into cardiomyocytes, smooth muscle cells and endothelial cells, which for the first time established an in vitro system to model early human heart formation using hES cells (Figure 1b). Cardiac differentiation from human embryonic stem cells. (a) A staged protocol to induce cardiac differentiation from human embryonic stem (hES) cells . (b) Modeling early human heart formation using hES cells. hES cells were induced as embryoid bodies using the protocol shown in (a). Day 6 embryoid bodies were dissociated and the KDRlow/C-KITneg population represents the multipotent cardiovascular progenitor cells with a transcriptional signature of ISL1+, TBX5+ and NKX2.5+. The KDRlow/C-KITneg population was further specified into major cardiovascular lineages, including cardiomyocytes, smooth muscle cells and endothelial cells. bFGF, basic fibroblast growth factor; BMP, bone morphogenetic protein; DKK1, Dickkopf homolog 1; ES, embryonic stem; KDR, kinase insert domain protein receptor; VEGF, vascular endothelial growth factor. As occurs with mouse ES cells, hES cell-derived cell cultures contain heterogeneous cell types. How to isolate cardiomyocytes from hES cell cultures with high efficiency and high purity remains a major challenge. Physical enrichment by manual dissection of beating areas or by Percoll gradient centrifugation has been utilized for cardiomyocyte enrichment [28, 35, 37]; however, the mixed undifferentiated hES cells within the cardiomyocytes prevented the future clinical use of the physically enriched cardiomyocytes. Therefore, genetically engineered hES lines that stably express drug-resistant genes within the cardiac cells were developed for cardiomyocyte enrichment. For example, a gene encoding an enhanced GFP-hyg resistant fusion protein driven by a human myosin light chain-2v promoter  or by the cardiacspecific human α-myosin heavy chain promoter has been introduced into human H9 ES cells for cardiomyocyte selection . High purity cardiomyocytes (99%) were enriched from hES cells with the selection of GFP-positive cells or neomycin-resistant cells [39, 40]. Although the drug selection method easily enriched more than 90% cardiomyocytes from hES cells, it has several limitations, such as virus integration, drug resistance, insufficient cardiomyocyte number and the difficulty of engineering each necessary ES cell line, which prevent the widespread use of this approach for generating a large quantity of healthy cardiomyocytes for future clinical use. Recently, ES cell lines were established from other species such as rat  and monkey [42, 43], and the derivation of cardiomyocytes from those ES cells described. Rat and monkey heart disease models could thus be used to evaluate functional improvements obtained following auto-transplantation of ES cell-derived cardiomyocytes, or the xenotransplantation of human ES/induced pluripotent stem (iPS) cell-derived cardiomyocytes. Rat- and monkey-derived cardiomyocytes could also be used to extensively study their functional characteristics, in vitro maturation, in vivo cell survival and functional integration. Recently, the most exciting breakthrough in stem cell biology has been the established feasibility of reprogramming fibroblasts into iPS cells. Both mouse and human iPS cells have been generated by transduction of four reprogramming factors, Oct4, Sox2, Klf4 and c-Myc [44, 45], or another set of reprogramming factors, Oct4, Sox2, Nanog and Lin28 . iPS cells are identical to ES cells morphologically and with regard to their gene expression profiles and the capability to form teratomas, and can differentiate in vitro into three germ layer cell types, including cardiomyocytes. Most of the protocols for cardiomyocyte induction from iPS cells were naturally adapted from ES cell studies. The cardiac differentiation of mouse iPS cells was carried out by Mauritz's group , who applied the EB-based differentiation protocol to mouse iPS cells and found that the final cell culture consisted of approximately 55% beating EBs. Mouse iPS cells showed comparable cardiac differentiation potential to ES cells and had similar structural and electrophysiological characteristics to ES cell-derived cardiomyocytes. Similar results were reported by several other groups [48, 49]. Although the robust differentiation capability of mouse iPS cells was demonstrated, cardiac differentiation from human iPS cells largely remains underdeveloped. In 2009, two groups demonstrated the derivation of functional cardiomyocytes from human iPS cells [50, 51]. Human iPS cell-derived cardiomyocytes exhibit a fetal-like phenotype and could be further designated as nodal-, atrial-, and ventricular-like cardiomyocyte subtypes . However, the frequency of contracting EBs and cardiomyocytes was very low (5 to 10%) in those two studies. Therefore, a major challenge was to increase the efficiency of cardiomyocyte differentiation from human iPS cells. By using a similar protocol to that shown in Figure 1a, Kattman and colleagues  reported the highly efficient generation of cardiomyocytes from human iPS cells with the isolation of kinase insert domain receptor (KDR)+platelet-derived growth factor receptor (PDGFR-α)+ populations, which gave rise to over 60% cardiomyocytes after differentiation. Interestingly, we found that various iPS cell lines, or even different iPS cell clones originated from the same fibroblast line, exhibited different cardiac differentiation efficiencies (data not published). This difference may result from the different reprogramming strategies or different epigenetic backgrounds of each iPS cell line. The staged protocol shown in Figure 1a provides unique access to human iPS cell-derived cardiovascular progenitor cells, as well as a substantial amount of cardiomyocytes, for a variety of studies. Although cardiomyocytes could be generated from human iPS cells, the safety of iPS cell-derived cells must be rigorously tested before clinical trials on patients are conducted. In addition, iPS cells have been derived from other species such as rabbit , pig [54–57] and monkey [58, 59], although cardiomyocyte generation from these iPS cells has not been described. Human iPS cells provide promising possibilities to bridge the gap between basic and clinical research and sustainable solutions for improving public health problems, such as human heart diseases. Heart disease is the leading cause of death in the United States, including coronary heart disease, ischemic heart disease, hypertensive heart disease, valvular heart disease and heart failure . While both environmental and genetic factors contribute to heart disease, single-gene defects have been identified as the direct cause of more than 40 cardiovascular disorders, including hypertrophic cardiomyopathy and inherited arrhythmias such as familial long QT syndrome (LQTS), short QT syndrome and conduction system disorders . Treatments for heart diseases include medication, device implantation, tissue ablation and eventually heart transplant. Heart disease therapy requires the development of patient-specific and disease-specific drugs, new cell resources for replacement therapy, as well as, ultimately, the engineering of whole human heart organs for transplantation. The limited availability of human cardiomyocytes is, however, a major obstacle for such progress. To date, animal models and non-human cardiomyocytes are still widely used as a major resource in these studies [62–65]. Human iPS cell-derived cardiomyocytes are renewable and free of the secondary abnormalities that result from end-stage disease, comorbidities, and prolonged pharmaceutical therapy. Thus, they offer an unprecedented opportunity to generate patient-specific lineages for disease modeling, drug screening, drug safety testing and potential cell replacement therapy of heart disease (Figure 2). Use of human induced pluripotent stem cell-derived cardiomyocytes. iPS, induced pluripotent stem. Given the complexities of many heart diseases, the first heart disease modeling studies focused on heart diseases caused by single gene mutations, which result in the disease phenotypes shown by single iPS cell-derived cardiomyocytes. To date, cardiac hypertrophy and cardiac channelopathy have been modeled using patient iPS cell-derived cardiomyocytes. Carvajal-Vergara and colleagues  generated iPS cell lines from patients with LEOPARD syndrome (LS) and non-affected controls. Approximately 40% of LS patients exhibit cardiac hypertrophy. LS iPS cells have a single T468M mutation in the gene PTPN11 (protein tyrosine phosphatase, non-receptor type 11), the same genetic defect as in their parents. Interestingly, the authors detected the hypertrophic phenotype in cardiomyocytes derived from iPS cells from LS patients, which was confirmed by the enlarged cell size, abnormal sarcomeric organization and nuclear localization of NFATC. Modeling of cardiac channelopathy has been reported by several groups. A subtype of cardiac arrhythmias, LQTS has been modeled using patient-derived iPS cells. Mutations of 12 genes (KCNQ1, KCNH2, SCN5A, ANK2, KCNE1, KCNE2, KCNJ2, CACNA1C, CAV3, SCN4B, AKAP9, and SNTA1) have been identified as the major cause of inheritable LQTS. Most of the disease-causing genes encode ion channels . LQTS leads to palpitations and a high risk of sudden death due to ventricular fibrillation, especially in the young [68–70]. These mutations prolong the duration of the ventricular action potential, thus increasing the QT interval. The most common causes of LQTS are mutations in the voltage-gated K+ channel genes, including KCNQ1 (type 1 LQTS (LQT1)) and KCNH2 (type 2 LQTS (LQT2)), and in the voltage-gated Na+ channel gene SCN5A (type 3 LQTS (LQT3)), which together account for more than 60% of inherited LQTS cases . The abnormalities of LQTS can be readily detected at the single cell level with electrophysiological assays such as the patch clamp, which makes LQTS an ideal heart disease to model with iPS cell-derived cardiomyocytes. Several groups have thus investigated the feasibility of modeling LQT1 , LQT2 , and Timothy syndrome (LQT3)  using patient-derived iPS cells. Cardiomyocytes derived from iPS cells of those patients recapitulated a delayed rectifier ion current, a typical phenotype detected in patients. Some studies have also tested the response of cardiomyocytes derived from iPS cells of LQT patients to pharmaceutical agents [72, 73]. All these studies represent a promising paradigm to understand the mechanism of human inherited heart disease and to develop novel drugs for disease therapy. These ground-breaking discoveries opened a new era in the study of heart disease using patient-derived iPS cells. However, the molecular etiology of these inherited heart diseases has not been clearly addressed. The reason lies in the difficulty of enriching a large number of purified cardiomyocytes from iPS cell cultures. In addition, single cardiomyocytes derived from iPS cells from LS and LQTS patients recapitulated only some aspects of the disease phenotype in two-dimensional cultures. For example, the susceptibility of single cardiomyocytes derived from iPS cells of LQTS patients to drug stimulation was different to that of the human heart . Given the fact that the heart is a complex structured organ with coupled ion influxes and electrical conductivity, it would be of great importance to investigate the mechanisms of heart diseases, especially abnormal electrical conductivities in cardiac arrhythmias, using a three-dimensional heart tissue engineered from cardiomyocytes derived from diseased iPS cells. Another advantage of human iPS/ES cell-derived cardiomyocytes is that they can be used as an in vitro model for drug safety testing because they originated from human and are scalable and reproducible in vitro. The first attempt at in vitro drug testing was reported by Braam and colleagues ; hES cell-derived cardiomyocytes revealed dose-dependent responses to 12 cardiac and noncardiac drugs, which could lead to the development of new drugs for the therapy of heart diseases. Thus, human iPS cell-derived cardiomyocytes can provide a novel patient-specific or disease-specific system for drug safety testing and drug screening. The potential use of hES cell-derived cardiomyocytes for cell replacement therapy was reported several years ago [75–77]. hES cell-derived cardiomyocytes were introduced into rodent heart disease models, resulting in functional improvements. However, research in this field remains underdeveloped, mainly because of poor engraftment efficiency after intra-myocardial transplantation into the myocardial infarction models [76, 78]. Studies have suggested that the low engraftment efficiency may be partly due to suboptimal cell resources, poor cell delivery, apoptosis of donor cells, and immunological rejection [76, 79]. In addition, because of the differences in the physiological and dynamic environments of rodent and human hearts, long-term integration of engraftment with hES cell-derived cardiomyocytes has not been detected. A better strategy is to utilize large animal models to study this as the electrophysiological characteristics of rodents are different from those of human. One ultimate goal of regenerative medicine is to transplant human iPS cell-derived cardiomyocytes in order to repair the damaged heart. However, safety concerns regarding virus integration during iPS cell reprogramming, the efficiency of cardiomyocyte generation from human iPS cell lines, the potential for tumor formation from mixed pluripotent iPS cells within the engrafts, and the fetal-like phenotype of iPS cell-derived cardiomyocytes are major obstacles in this field. Ieda and colleagues reported the direct reprogramming of mouse fibroblasts into induced cardiomyocytes (iCMs) through the introduction of three factors: Gata4, Mef2c and Tbx5 . By comparing microarray data from cardiomyocytes and cardiac fibroblasts , the authors selected 14 candidate factors that play key roles in cardiac differentiation. Of these 14 candidates, Gata4, Mef2c and Tbx5 were identified as the master reprogramming factors, responsible for the generation of 5% cTNT (a thin filament protein specifically shown in a contractile complex in cardiomyocyte) positive cardiomyocytes from cardiac fibroblasts. Interestingly, the iCMs showed similarity to mature mouse ventricular cardiomyocytes. This study shed new light on studies of heart development and possible clinical applications, yet this system has not been extended to human cells and this finding has not been confirmed by other groups. Alternatively, mouse fibroblasts were reprogrammed into cardiomyocytes by four iPS cell reprogramming factors (Oct4, Sox2, Klf4 and c-Myc) combined with a chemically defined differentiation medium . Spontaneously contracting cells were present in the culture from day 11. At day 18, over 50% of the cells had started beating, and this could reach 80% of cells after extended culture. The functional characteristics of these cells were assayed by calcium flux recording and electrophysiological tests. Overall, the authors claimed a direct reprogramming of fibroblasts into cardiomyocytes without the pluripotent state. However, considering the use of iPS cell reprogramming factors and the very fast differentiation of mouse ES/iPS cells into cardiomyocytes (normally within 5 to 6 days), it is likely this method initially converted fibroblast cells into an early pluripotent state followed by immediate cardiomyocyte commitment. Given the much longer time windows for human iPS cell reprogramming and for cardiomyocyte differentiation from human ES/iPS cells, confirmation of this direct reprogramming strategy with human cells would provide more details on the underlying mechanisms. To date, iPS cells have been generated from various somatic cell types, including fibroblasts , blood [83, 84], melanocytes , pancreatic β cells , and neural progenitors [87, 88]. Interestingly, early passage iPS cells were found to retain a transient epigenetic memory of their original tissue type, which influenced their subsequent differentiation capability [89, 90]. Studies from Srivastava's group  showed that iCMs exhibit a mature ventricular cardiomyocyte phenotype and heart-derived fibroblasts gave rise to two-fold more iCMs than tail-derived dermal fibroblasts, indicating that the epigenetic memory of fibroblasts could affect the derivation of iCMs. All these studies strongly suggested that the tissue origin or tissue memory of fibroblasts could affect the reprogramming of iPS cells, as well as the further differentiation of iPS cells into various lineages. Spontaneously beating cardiomyocytes have been detected from ES cells cultured in the absence of factors supporting self-renewal. For the past decade, however, the efficiency of generation and purity of ES cell-derived cardiomyocytes remain largely unsatisfactory. Recent progress established a staged protocol to efficiently induce cardiac differentiation from ES cells by recapitulating the early events of heart formation (Figure 1a), which for the first time provided a large amount of multipotent cardiovascular progenitor cells. Thus, ES cells can be used to model early human heart formation and be utilized as a tool to address early heart determination and specification in vitro. However, ethical issues with hES cells have prevented the widespread use of ES cells and their differentiated progenies. With the breakthrough of iPS cells, pluripotent stem cells can be easily converted from somatic cells without requiring embryos. Most importantly, iPS cell technology opens a new era in obtaining unlimited patient-specific lineage cells, which will harbor the same genetic defects as the patients. Cardiomyocytes derived from patient-specific iPS cells would greatly accelerate the understanding of human inherited heart diseases and benefit drug development and potential cell replacement therapies for human heart disease. Although issues such as virus safety, tumor formation after transplantation and nonpurified donor cells are current hurdles to the direct use of iPS cell-derived cardiomyocytes for clinical use, iPS cells so far provide the most promising resource for scientists to eventually bridge the gap between basic research and sustainable solutions for the treatment of human heart disease. This work was supported by AHA SDG grant #11SDG5580002 (to LY) and by National Science Council (Taiwan) grant # NSC100-2917-I-564-015 (to T-YL). LY prepared the figures. Both authors contributed to the writing of the manuscript, and read and approved the final version.